Enercon urgently needs new markets to compensate for the sharp downturn in the German onshore wind market. Just 135MW was installed in Germany in January and February 2019, 60% less than the 330MW in the same two months of 2018. "We have the technologies but the current policy framework still often makes it impossible to implement the ideas," said Kettwig. After years of research and development, the company is now marketing its system solutions for integrating renewables into the energy system. "In contrast to our competitors, we can offer wind turbines as part of a package with sector coupling and storage solutions, also acting as cooperation partner in consortia, to grow our customer pool to include municipal utilities and larger energy companies," the company said. Enercon installed 1,050 wind turbines with a total 2,840MW around the world in 2018, an 18% decline compared with 3,458MW in 2017, and down 26% compared with the 3,833MW installed in 2016. Germany‘s onshore wind market slump is blamed for the slide, as total domestic onshore installations reached only 2,268MW in 2018, down 57% compared to 5,333MW in 2017. Enercon installed 390 turbines accounting for 1,282MW – or 57% – of Germany‘s 2018 onshore total, maintaining its position as domestic market leader. The firm expects the overall German onshore market in 2019 to shrink again to just 1.8-2GW but "will do everything it can to raise Enercon‘s domestic market share". At the end of March, Enercon reported just ten turbine installations in Germany during the first quarter of 2019, and anticipated a mere 500-600MW in its home market for the whole year, less than half its 2018 domestic installations. If the 2019 outlook materialises, and there is no improvement into 2020 in the project permitting and auction situation, "it will be clear to everyone what such a sharp reduction will mean for component suppliers and market players in Germany," warned the company. In 2018 already, Enercon has slashed contracts with its German suppliers including tower segment producers WEC which installs concrete towers, rotor blade companies Aero Ems, Kunststofftechnologie Aurich, RBO Rotorblattoberflächen, Composite Material Supply and Aero Rotorblattfertigung. The loss in contracts contributed to some 835 job losses. Enercon declined to reveal its 2018 financial results, but said the drop in installations in 2018 will have "a very significant negative effect on the earnings situation". Enercon‘s 2018 results will extend a downward profit trend. In 2017, Enercon reported pre-tax profit of €423 million on revenues of €5.6 billion. The pre-tax profit was 29% lower than the €603 million earned on revenues of €5.1 billion in 2016, and 41% lower than 2013‘s pre-tax profit of €712 million on turnover of €4.9 billion. To cope with the shrinking domestic market, Enercon has launched EP3 and EP5 turbine types to meet new market challenges, and proclaimed a drive for more efficiency, a focus on international markets, and moves into new markets for renewable energy system solutions. 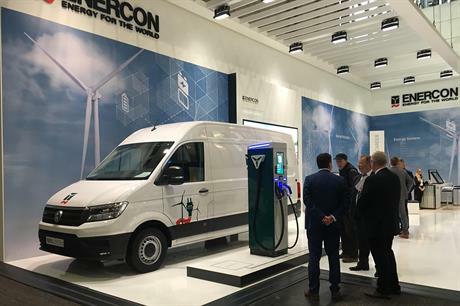 In the second half of 2019, Enercon will open electric vehicle ultra-fast filling stations using in-house charging and control electronics technology. It has already installed the first two prototypes of its bi-directional power conversion system for swift battery charging and discharging in France and Germany. Enercon‘s electricity trading division Quadra Energy markets renewable electricity from 5,549MW of mainly wind capacity, about 10% of the German wind fleet. This places it second in the pecking order of renewable electricity marketing companies, after Statkraft with around 11.5GW, but ahead of energy majors Vattenfall and E.on with around 5.6GW and 4.2GW, respectively. In future, Enercon aims to get closer to the market leader. The company is active in 45 countries and wants to continue growing. By the end of 2018, Enercon had installed 29,350 wind turbines totalling 50.6GW around the globe.